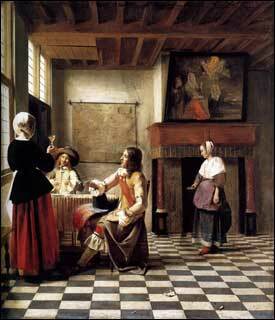 Pieter de Hooch. A Woman Drinking with Two Men, c1658. Is hurried by the force of charms away. That waits on love, and takes you by surprise. Or that his very soul she knew. My love, my Genius waits you everywhere. Restoration Verse, 1660-1715. William Kerr, ed. Page created by Anniina Jokinen on June 23, 2006. Last updated on February 21, 2011.